Today the California Air Resources Board will be kicking off its first of three workshops on the development of the AB 32 Cap and Trade Investment Plan. On February 25th in Sacramento the Transportation Coalition for Livable Communities – which includes local/regional governments and transit/transportation agencies statewide – will be laying out a vision for how revenues generated from the state’s program could re-shape California’s urban and rural landscape through integrated land use and transportation investments that build on regional SB 375 and GHG reducing plans with competitive grants for local entities. This opportunity to fund beautiful communities would invest billions of dollars in both the critical transportation investments needed in existing communities, while leveraging local land use and policy changes needed to transform how transportation planning and implementation functions in California. This approach of combined land use strategies co-implemented with livable community infrastructure in the hearts of communities will yield significant long-term greenhouse gas reductions as well as numerous community benefits, such as improved public health, open space and habitat preservation, safe routes to school, and needed support for disadvantaged communities. 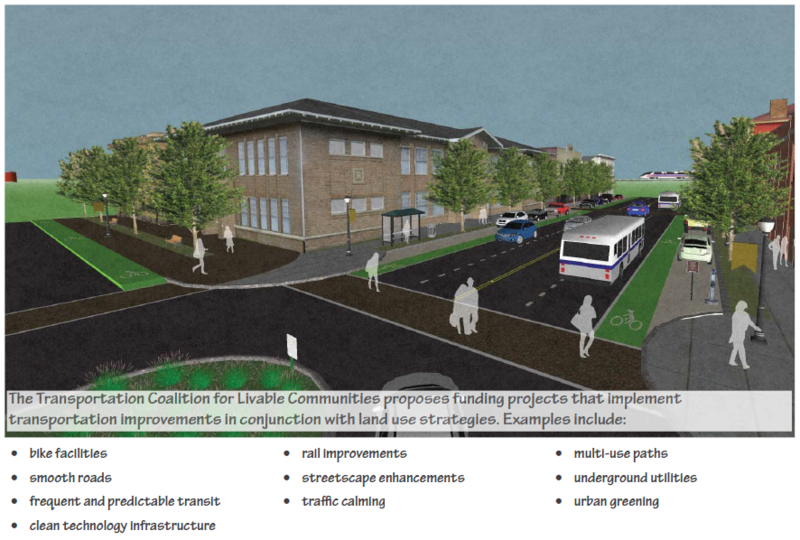 The Coalition’s program concept would allocate funds equitably to regional governments under statewide criteria to administer competitive grants to local entities – proposing combinations of investments, including transit service and operating costs, road and bridge maintenance, retrofits for complete streets and urban greening, and clean technology and other community infrastructure – all integrated with land use modifications to support regional plans. Favoring integration of land use strategies and transportation investments to achieve the highest GHG emission reductions. Studies consistently show that combining transportation investments with complementary land use changes significantly increase the GHG emission reduction and co-benefits. Use a competitive process at the regional level, under criteria developed by the state, to prioritize local project proposals that co-implement transportation investments with land use changes that most cost effectively meet the goals of the program and further stimulate innovation and flexibility at the local and regional level. Improved modeling and verification systems for GHG evaluation to ensure effective results.